BoogieWoogieGuitar Will Make Your Fingers Dance! Great fingerstyle guitar instruction in Del Rey's BoogieWoogieGuitar guitar lesson DVD. This how-to-play-fingerstyle-guitar video is beautifully shot and recorded. The instructor's no slouch, either. Del Rey is a Seattle, Washington based musician. Her specialty is fingerpicking and singing old blues and jazz tunes. She is a master (mistress?) at arranging songs originally played on other instruments and translating them for the guitar. On Boogie Woogie Guitar , Del shows her approach to adapting boogie woogie piano to the guitar. As you can imagine, this guitar lesson DVD places a lot of emphasis on movement on the lower strings of the guitar. BoogieWoogieGuitar begins with Del playing Memphis Minnie's Nothing In Rambling. She includes showing her right hand technique. It appears to me to be a classical guitar based approach. This is logical since she started out as a classical guitarist before discovering blues. Thankfully, there are very good closeups of both hands. This is a Homespun Video and is consistent with their always good production values. Rey introduces her approach to boogie woogie bass lines while showing the tune. She then breaks the technique down and shows how to play it all over the fingerboard. Del rarely plays barre chords. 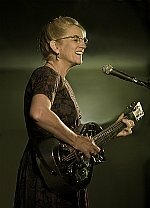 She plays a Ron Phillips resonator guitar set up with really heavy strings (D'Addario .14-.59). This gives her a HUGE acoustic sound but a pretty stiff action, more than likely. This may be a factor in her chord form choices. At any rate, she shows how to take basic first position chords and move them around the fingerboard. Rey shows what I think are another couple of neat concepts. First off, she shows how to play walking bass lines in the key of E. This exercise isn't tied to a song like some of the others are. Instead, it's a stand alone exercise. The other thing that Del shows is playing ascending and descending lines at the same time. This is a trick that piano players frequently use. It creates a unique sense of movement and is a great trick for any guitarist to master. BoogieWoogieGuitar also includes an arrangement of a song called Boogie Mysterioso. This is definitely NOT your typical fingerstyle blues guitar song! This is an arrangement taken from a band arrangement. On this tune Del Rey demonstrates acouple of interesting techniques. The first one is playing a walking bassline using octaves. In her hands it's a driving, propulsive part of the song. The other thing that she shows is playing a repeating pedal tone while walking the bass. Techniques like this can make a solo guitarist sound like a full band! BoogieWoogieGuitar also shows two other songs: Louise Johnson's On The Wall and a tune named Boogie Woogie Country Girl. On these, Del Rey shows you how to play them but there aren't any new techniques shown. Still, they're great songs and look like a lot of fun to play. Del Rey's BoogieWoogieGuitar shows a great player demonstrating her unique approach to fingerstyle solo guitar. While all of the songs on the disc are well worth learning, the techniques shown are the real gold. Learning the techniques shown on BoogieWoogieGuitar will help shift your own playing to a higher level. You can find out more about Del Rey's music, tour schedule and instructional materials by visiting her website.